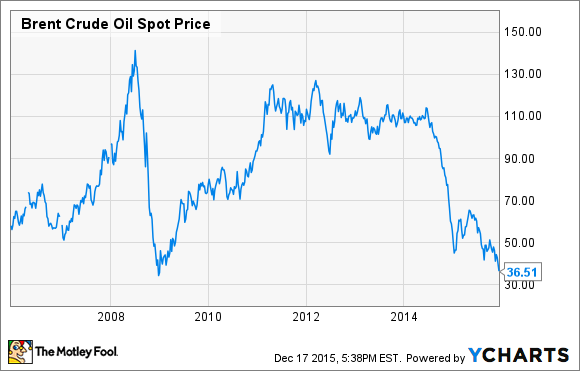 Oil Prices: Is Recent History Poised to Repeat Itself? Oil prices are low right now, but the same scenario that led to a super spike earlier in the decade is unfolding right before our eyes. Right now, the oil market is in the doldrums. The price of crude recently hit a seven-year low, with some in the market suggesting oil could go even lower. While that's quite possible, the longer-term outlook for crude is much different. In fact, there's an eerily similar setup happening that could lead to history repeating itself with another super spike looming. The possibility of $150-$200 per barrel seems increasingly likely over the next six-to-24 months, though predicting the ultimate peak in oil prices as well as the remaining duration of the upcycle remains a major uncertainty. It was a forecast based on surging demand and weakening supply. It mentioned that demand was being fueled by China, which doubled its oil use during the decade. At the same time, supplies were weakening, with the bank noting that production from Mexico and Russia was shrinking, while spare production capacity at OPEC was low. Adding fuel to crude's surge was the fact that the U.S. was wrangling with Iran over its plans to develop nuclear energy, Africa's largest oil exporter, Nigeria, was under militant attacks leading to output halts, and Venezuela's production was slumping due to its economic issues. These worries drove up the price of crude to just over $130 per barrel within a matter of months. While crude would quickly collapse during the financial crisis, it subsequently recovered back into the triple digits within two years. This is because the same concerns that drove crude higher never really went away. The same concerns remain today, even if they are on the back burner at the moment because of the temporary oversupply of oil currently on the market. Are we being set up again? That oversupply led to a steep slide in oil prices over the past year, which has done two things: Reignited demand and slammed the brakes on supply growth. After just growing 700,000 barrels per day in 2014 -- the lowest rate in two years -- demand for oil accelerated in 2015 and is expected to be 1.4 million barrels per day higher, with another 1.4 million barrels of demand expected next year, according to the U.S. Energy Information Administration. It's demand that could soon begin to sop up the glut of crude on the market. At the same time, crude oil production is heading lower, with U.S. oil production peaking earlier this year and expected to decline 570,000 barrels per day, according to the EIA's latest forecast. Meanwhile, production in places like Mexico is slipping, with its production this year falling to 2.25 million barrels per day, down from 2.56 million barrels per day in 2012, and well off its peak of 3.4 million barrels in 2004. More declines are on the way. Major oil producers Chevron (NYSE: CVX) and ExxonMobil (NYSE: XOM) are delaying large-scale oil projects because of weak project economics. Chevron, for example, has been holding back on investing in its Rosebank North Sea development since 2013 because of weak project economics, and that was when crude oil was in the triple digits. Meanwhile, Exxon has the potential to delay up to 25 future projects that would deliver 2.5 million barrels of future supply because the returns just aren't there right now. Combined, the industry could defer upwards of 19 million barrels of future daily output, which would start impacting supplies as early as 2017. For an industry that has a roughly 2% margin for error on supply, which is shrinking alongside OPEC's spare capacity, this is a concern. Then there's the X-factor that played into the fears stoking the 2008 surge in crude, which are the same storylines we see today, but at the moment, they're hidden in the background. The U.S. is still making headlines with Iran over a nuclear deal that could lead to more oil flooding the market, or the deal could fall apart, leading to much less oil than expected hitting the market over the next few years. Meanwhile, in Nigeria, the militant Islamic group Boko Haram is growing in prominence and is threatening the oil industry in that country. Then there's the rise of ISIS and the threat it poses to the oil fields of southern Iraq, as well as to public safety around the world. Finally, Venezuela's economy remains in shambles, leading to worries about its future oil output. The case could be made that these geopolitical issues really haven't changed and could actually be getting worse. Add it all up, and the world is quietly being set up for another super spike in the price of oil. It's a spike that few see coming right now because the focus is on how low oil will go in the short run. However, for those who can read the handwriting on the wall, now would seem to be the time to buy oil stocks like Chevron and Exxon that have the strength to make it through the current tough time, because the light at the end of the tunnel is growing brighter by the day.